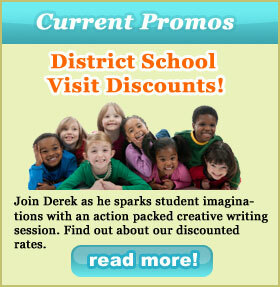 Derek Munson, award winning author, brings incredible enthusiasm and fun to his workshops and presentations. His teaching philosophy is simple: First, cultivate an environment where artistic expression is irresistible. And second, provide a solid framework for sharing that art with others. Just like a Chia Pet. This presentation explores the ingredients of both friendship and “enemyship” in a unique and entertaining way. It includes a reading of the story “Enemy Pie”, a brief discussion about friends and enemies and a crazy experiment involving some gross and gooey ingredients. This is a student favorite! Presentation: 50-55 minutes, maximum 120 students, grades K-3. This presentation includes a reading of “Enemy Pie” followed by a discussion about how the story became a book. From inception to the illustration process and beyond with time for questions and answers. A great option for large schools. Presentation: 50-55 minutes, grades K-3, any size group. Immerse your students in an action packed adventure through possibility, imagination, and inspiration! Join Derek Munson and explore the creative writing process, touching on the six traits of writing, through his experiences as a successful author, world class skateboarder, and owner of the zaniest company in the galaxy. And be prepared for super-energized students, ready to launch the best story ever- the story of their own wildest dreams! Presentation: 50-55 minutes, any size group, grades 3-6. In these writing mini-workshops, your students will use their hobbies and interests as a launching pad for a collaborative writing journey. We’ll have a blast exploring character development, story structure and connecting with an audience. Workshop: 50-55 minutes, 30-60 students, grades 4-8. These six-week programs will empower your students with confidence- not only as writers, but also as dreamers. Effective creative writing principles will be explored through the themes of awareness, imagination, connection, and flow. Workshops: Grades K-8, any size group.